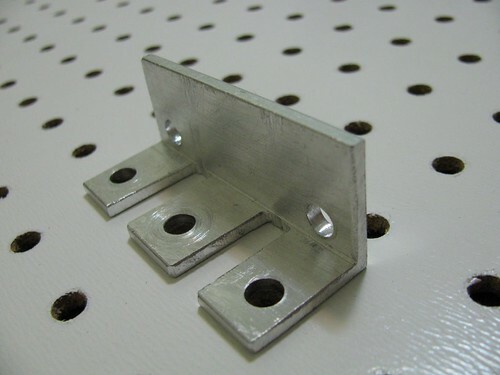 The motor mount is the angle stock with two 1/4" holes for 23 size stepper motor, two slots and three holes compatible with the perforated angle (1" apart). NEMA23 has 1/16" thick circular protrusion around the shaft which prevents from mounting it flush with the mount. 1/16" thick steel or rubber washers (one or more) are used in between the motor and the mount. Rubber washers significantly reduce vibrations and noise.